Monday 30th April 2018 – 11.25am – Murray MacGregor. 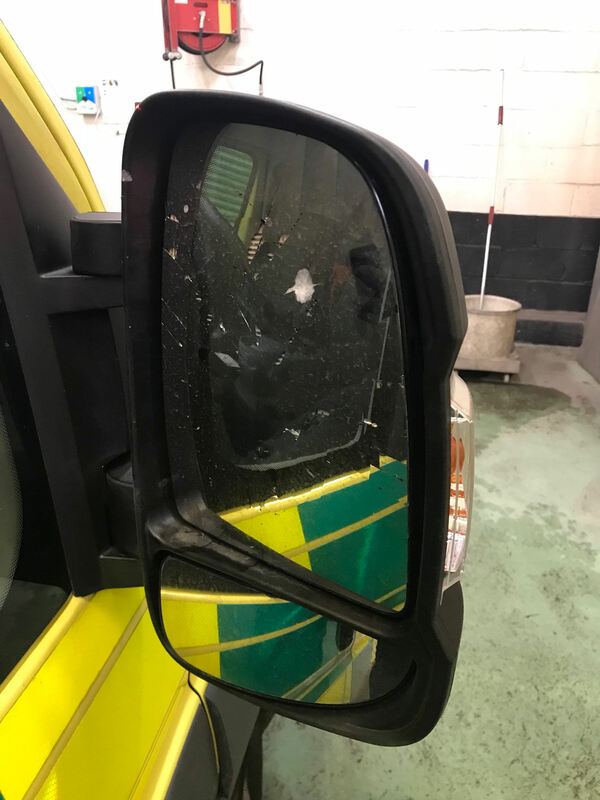 Ambulance bosses are appealing for members of the public to help them identify the person who damaged an ambulance as it was treating a patient. The incident happened in Wildwood in the Woodside area of Telford at about 1.20am this morning (Monday). The crew had been treating a medical case at the time when the unprovoked attack happened. 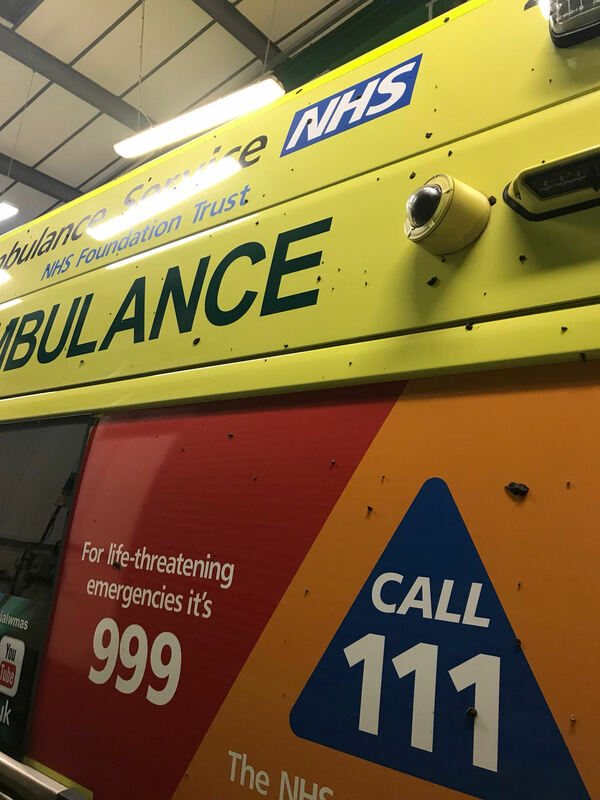 A West Midlands Ambulance Service spokesman said: “How can it possibly be appropriate for anyone who has nothing to do with the case the ambulance crew are dealing with to suddenly start attacking the vehicle? “Sadly, many of our crews are familiar with this sort of behaviour, but when you are a patient, this must have been terrifying. Friday 27th April 2018 – 1.00pm – Claire Brown. A Birmingham Paramedic, with a passion for saving lives and social media, was chosen to represent the Trust at a European Emergency Services conference this week in Slovenia. Whether you love it or loathe it social media is a big part of the world we live in. As such, West Midlands Ambulance Service uses Twitter, Facebook and Instagram to engage with our social media community every single day. In addition to @officialwmas, we’re supported by more than 70 corporate tweeters who use their individual accounts to share their day, knowledge and experiences with their followers. Earlier this year we were approached by the organisers of the European Emergency Number Association Conference 2018 which showcases the latest updates and emerging trends in the field of emergency services. After seeing the way the service uses social media, the conference organisers invited West Midlands Ambulance Service to present at the event. Rob Moore, a Paramedic and Clinical Team Mentor based at Erdington Hub in Birmingham, was nominated to represent the Trust at the conference which he attended on Thursday this week in Slovenia. Rob is one of the Trust’s corporate tweeters – @wmasrobmoore. He has more than 8,000 followers and, last year, launched a social media campaign called #bluelighthappy which encouraged people to share positive stories and experiences about team 999. The hashtag went global and continues to flourish. During the conferences ‘social media strategies and tools’ session Rob presented to the audience on how he and West Midlands Ambulance Service utilises social media. Rob with fellow panelist Volker Tondorf, Marina Tymen, Laurent Alfonso and Olivier Galichet. Friday 27th April 2018 – 10.00am – Claire Brown. A collision which left one car overturned meant a team effort to provide vital emergency treatment to two occupants last night in Shropshire. The incident happened on the A53 in Market Drayton shortly before 8.00pm last night (Thursday). Two ambulances, a MERIT trauma team with a doctor on board and a paramedic officer attended the scene. A West Midlands Ambulance Service spokeswoman said: “When ambulance staff arrived on scene they found a woman in her 50s sitting on a grass verge at the side of the road. She had managed to get out of her vehicle unaided following a collision with another car and, after assessment, was found to have sustained facial injuries as well as a suspected pelvic injury. Crews immobilised her to help stabilise her pelvis before she was taken to Royal Shrewsbury Hospital for further checks. Friday 27th April 2018 – 9.15am – Claire Brown. A two-car collision in Worcestershire last night left a woman injured and a man needing rapid transport to hospital by air ambulance for emergency treatment. West Midlands Ambulance Service was called to Naunton Road in Pershore shortly before 6.45pm last night (Thursday). Two ambulances, a doctor from Mercia Accident Rescue Service (MARS), the Midlands Air Ambulance from Strensham and the MERIT trauma team with a second doctor on board attended the scene. A West Midlands Ambulance Service spokeswoman said: “Crews arrived to find two cars which had been involved in a serious collision. One woman in her 30s had managed to self-extricate from her vehicle prior to ambulance staff arriving and, upon assessment, was found with a head wound and various pains. She was given pain relief to ease her discomfort before being taken by land ambulance to Worcestershire Royal Hospital for further treatment. Wednesday 26th April 2018 – 8am – Jamie Arrowsmith. A man has died and two others suffered serious injuries following a road traffic collision involving a car and a van last night (Wednesday). West Midlands Ambulance Service was called to Kingstanding Road at 6.41pm and sent three ambulances, a senior paramedic officer, two paramedic officers, the Midlands Air Ambulance from Cosford, the Midlands Air Ambulance crew from Staffordshire in a rapid response car and the Warwickshire and Northamptonshire Air Ambulance Critical Care Car to the scene. A West Midlands Ambulance Service spokesman said: “On arrival, crews discovered three patients, all men from the van, which had also collided with a tree. “The driver was found to be in cardiac arrest and CPR was already being carried out by the fire service on arrival of ambulance staff. Crews took over and administered advanced life support, but unfortunately it became apparent nothing could be done to save him and he was confirmed dead at the scene. “The remaining two patients had also suffered serious injuries in the collision. They both received specialist trauma care at the scene and were transported to Queen Elizabeth Hospital by land ambulances. Doctors travelled with both patients to continue emergency treatment en-route. Wednesday 25th April 2018 – 5pm – Jamie Arrowsmith. A man has been airlifted to hospital following a collision involving a motorbike and a car this afternoon. West Midlands Ambulance Service was called to the junction of Bull Lane and Charnwood Close in Bilston just before 2pm. One ambulance, a paramedic officer and the Midlands Air Ambulance from Cosford, with a doctor on board, attended the scene. A West Midlands Ambulance Service spokesman said: “Crews arrived to find the motorcyclist, a man believed to be in his 20s, lying on the pavement. “It quickly became apparent he had suffered a serious leg injury in the incident. He received specialist trauma care at the scene, was given pain relief and immobilised before being airlifted to Queen Elizabeth Hospital, Birmingham. Wednesday 25th April 2018 – 3pm – Jamie Arrowsmith. A man has been airlifted to one of the region’s major trauma centres and a woman has been taken to hospital following a two-car road traffic collision this afternoon. West Midlands Ambulance Service was called to Ironstone Road in Burntwood at 12.50pm and sent two ambulances, a paramedic officer and the Midlands Air Ambulance from Cosford, with a doctor and critical care paramedic on board, to the scene. A West Midlands Ambulance Service spokesman said: “Crews arrived to find two cars that had been in collision, one of which had come to rest on its roof. “The most seriously injured patient, a man, was a driver in the other car. He managed to get himself out of the vehicle but was treated for a serious chest injury. “The man, who was fully conscious, was immobilised and given pain relief before being airlifted to Queen Elizabeth Hospital, Birmingham. Tuesday 24th April 2018 – 4.45pm – Claire Brown. A motorcyclist received advanced trauma care at the scene of a road traffic collision in Rugby this afternoon. West Midlands Ambulance Service was called to Coal Pit Lane, Willey, Rugby shortly before 1.30pm (Tuesday). An ambulance, a paramedic officer and the Critical Care Car from the Air Ambulance Service with a medic on board attended the scene. Friday 20th April 2018 – 3.30pm – Jamie Arrowsmith. A man has sadly died following a road traffic collision this afternoon. West Midlands Ambulance Service received a call to reports of a man who had come off a motorbike on Thorncroft Way, Walsall, shortly after 1.40pm and sent two ambulances, a paramedic officer and the Midlands Air Ambulance from Strensham to the scene. A West Midlands Ambulance Service spokesman said: “Crews arrived to find the man in cardiac arrest. An off-duty firefighter was already at the scene performing excellent CPR. “Ambulance staff took over and also administered advanced life support. Care, compassion and kindness – Ambulance is back! Friday 20th April 2018 – 1.15pm – Murray MacGregor. The extraordinary lengths that ambulance staff go to, to ensure patients receive the care they need is set to be highlighted again in the new series of the BAFTA nominated programme Ambulance. The eight-part observational documentary will be shown on primetime BBC One from Thursday (26th April) at 9.00pm. It is the second series to feature West Midlands Ambulance Service. The programme will show staff as they deal with the highs and lows of life on the road and in the control rooms. The programme follows the staff as they deal with everything from major trauma including road traffic collisions and stabbings, acutely unwell babies, through to patients with complex medical conditions and a 999 call from someone who wants to commit suicide. The programme also looks at how ambulance staff deal with situations when their own loved ones become the patient. With unparalleled access, each episode follows the call-handlers and ambulance dispatchers in the regions two control-rooms along with the ambulance crews out on the ground as they respond to nearly 4,000 emergency 999 calls every single day. The programme was filmed in December and January when the NHS was under immense pressure and shows the lengths staff in the ambulance service and hospitals go to ensure patients continued to get high standards of care. During the programmes, you’ll get to see how the staff deal with an increasingly busy service, an ageing population, and the challenges of working with out-of-hours services and GP surgeries as well A&E departments who are also getting increasingly busy. WMAS Chief Executive, Anthony Marsh, said: “The thing that comes over from these programmes is the incredible professionalism of our staff as they deal with the challenges that they are presented with, never knowing what the next call might bring. “I am proud that we have been able to show the diverse nature of our workforce and how we interact with people from every area and community of the West Midlands. Kirsty Cunningham, Executive Producer at makers Dragonfly Television, added: “Ambulance goes way beyond the traditional genre of blue flashing lights television and really explores the stories of people in crisis against a backdrop of mounting pressures, from political to societal changes. Tuesday 17th April 2018 – 8.15am – Claire Brown. A man sadly died in a road traffic collision in Oswestry last night. West Midlands Ambulance Service received a call from the police to reports of a collision involving a car and a pedestrian at the junction of the B5069 and the A5 in Gobowen, Oswestry shortly after 9.30pm last night (Monday). Two ambulances and two paramedic officers attended the scene. A West Midlands Ambulance Service spokeswoman said: “Crews arrived to find a man who was in cardiac arrest following a collision with a car and was receiving CPR by passers-by. Ambulance staff quickly took over resuscitation efforts but, sadly, nothing could be done to save the man and he was confirmed dead on scene a short time later. Tuesday 10th April 2018 – 8.30am – Jamie Arrowsmith. A woman has died following a road traffic collision on the M5 this morning. West Midlands Ambulance Service was called at 4.24am to reports of a collision involving a car and a lorry between junctions four and three of the M5 and sent one ambulance, a paramedic officer and a MERIT trauma doctor to the scene. A West Midlands Ambulance Service spokesman said: “On arrival, crews discovered a woman in the car, who was found to be in cardiac arrest. “Unfortunately, it quickly became apparent nothing could be done to save her and she was confirmed dead at the scene. Monday 9th April 2018 – 10am – Jamie Arrowsmith. A young boy has died and a woman has suffered serious injuries following a road traffic collision last night (Sunday). West Midlands Ambulance Service was called to reports of a collision between a car and pedestrians at 9.03pm on Stoney Stanton Road in Coventry. Four ambulances, a paramedic officer, a MERIT trauma doctor and the Warwickshire and Northamptonshire Air Ambulance Critical Care Car were sent to the scene. A West Midlands Ambulance Service spokesman said: “On arrival, crews discovered a young boy who had suffered serious injuries in the collision. “Ambulance crews administered specialist trauma care which continued enroute to University Hospital Coventry and Warwickshire. However, shortly after arrival it sadly became apparent nothing could be done to save him and was confirmed deceased. Friday 6th April 2018 – 3.30pm – Jamie Arrowsmith. A man who was trapped in the cab of his lorry following a collision between two HGVs on the motorway this afternoon has been treated by ambulance staff and taken to hospital. West Midlands Ambulance Service was called to the northbound carriageway of the M6, between junctions 15 and 16, at 2.01pm and sent three ambulances, two paramedic officers and the Midlands Air Ambulance from Staffordshire to the scene. A West Midlands Ambulance Service spokesman said: “Crews arrived to discover two patients, both men, who were the drivers of the lorries. “One of them, believed to be in his 50s, was trapped as a result of the collision and had to be freed with help from the fire service. “Ambulance staff monitored and assessed the man throughout the extrication before treating him for chest pain. “He was then transferred to Royal Stoke University Hospital by land ambulance. Tuesday 3rd April 2018 – 12.30pm – Claire Brown. A woman has died and a man has been rushed to hospital following a suspected carbon monoxide leak at a property in Cannock this morning. West Midlands Ambulance Service was called by the police shortly after 10.30am earlier today to Old Penkridge Road in Cannock. Two ambulances were sent to the scene. A West Midlands Ambulance Service spokeswoman said: “When ambulance crews arrived they found two patients, a man and a woman, who had been removed from the property by the fire service after they were found unresponsive inside. Sadly, the woman was confirmed dead by ambulance staff at the scene.